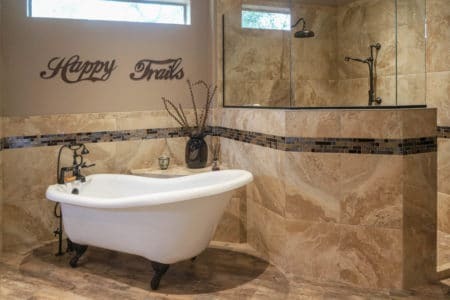 Are you thinking of embarking on a luxury bathroom remodel project so that you can finally have the bathroom of your dreams in your Phoenix, Arizona, home? Don’t go it alone! Partnering with an experienced design and build team can help your dream bathroom become a reality. Professional bathroom designers can use your vision as inspiration to truly create a masterpiece that you can enjoy for years to come. How would you like to end your day decompressing in a steam shower? You can essentially have your own personal steam room to let the worries and responsibilities of the day melt away. Or, maybe you’d like to pretend you’re standing under a waterfall from a hot spring as you bathe? A rain shower head can certainly mimic that experience. Stylish fixtures such as LED lighting, designer channel drains, and mosaic tile floors can provide your bathroom with an elegant look. A shower splash wall can open up your space and eliminate the need for a tub or shower door. These are just some ideas that a professional luxury bathroom remodel designer can add to your vision. If you’re ready to enjoy a new modern luxury bathroom for your home in the Phoenix, AZ, area, turn to the design-build specialists at Premier Kitchen & Bath. When you call us, we’ll set up a complimentary consult where our design team will discuss the possibilities for your luxury bathroom remodel. Then, we’ll have a design and planning meeting where you’ll be able to view a 3D rendering of your dream bathroom. Revision meetings will follow to ensure that everything you ever wanted in a luxury bathroom is included in the design. And then when the big day arrives, your assigned Project Manager and our team of technicians will begin installing your new bathroom products, ensuring that you are 100 percent satisfied with the end result. Your luxury bathroom remodel is just a phone call away. Contact Premier Kitchen & Bath today to get started. We proudly serve homeowners in Phoenix, AZ, and surrounding areas.